With brilliant sunshine and high temperatures RHS Hampton Court Palace Flower Show 2017 got off to a great start, writes Sandy Felton. 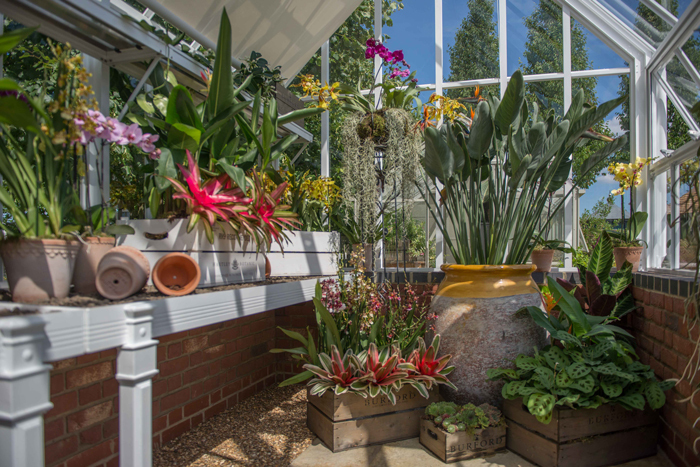 This year the Royal Horticultural Society (RHS) has awarded 141 medals to the gardens, floral exhibits and flower and vegetable boxes, comprising 57 Gold Medals, 47 Silver-Gilt, 29 Silver medals and eight Bronze. Here is a run-down of some of the awards. 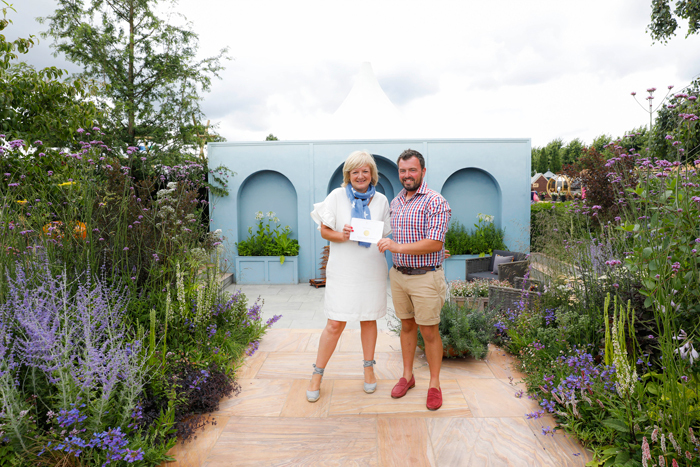 Best Show Garden goes to designers Adam White and Andrée Davies for ‘The Zoflora & Caudwell Children’s Wild Garden‘ (Gold). The garden showcases the qualities of therapeutic outdoor spaces for children with disabilities and will be rebuilt after the show at the Caudwell at Keele University which provides support for children with developmental disorders. Landform Consultants are awarded the Best Construction Award for the Blind Veterans UK: ‘It’s All About Community Garden’ (Gold) designed by Andrew Fisher Tomlin and Dan Bowyer. 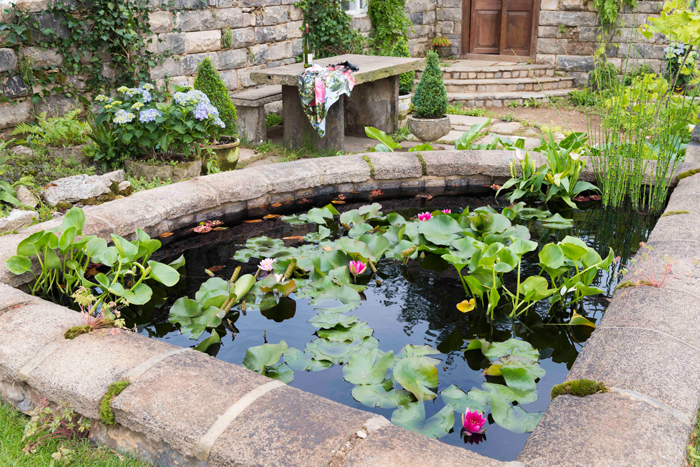 This garden champions traditional craftsmanship and provides a vibrant garden celebrating the beneficiaries, volunteers and staff at Blind Veterans UK. Also winning Gold in the Show & World Garden category is Paul Hervey-Brookes ‘Viking Cruises World of Discovery Garden‘. This garden is inspired by a couple’s travels across the world and featured foreign treasures such as Rome’s Arch of Constantine, perfectly complemented by the mosaic motifs of Bradstone’s Manzano paving. Paul is pictured above with his Gold Medal. Bill Wilder’s ‘Elements of Life‘ (Gold) took home Best Conceptual Garden with its exploration of plant roots and scientific soil composition. ‘Future Gardens. London: London Glades‘ (Gold) was awarded Best Garden for a Changing World. 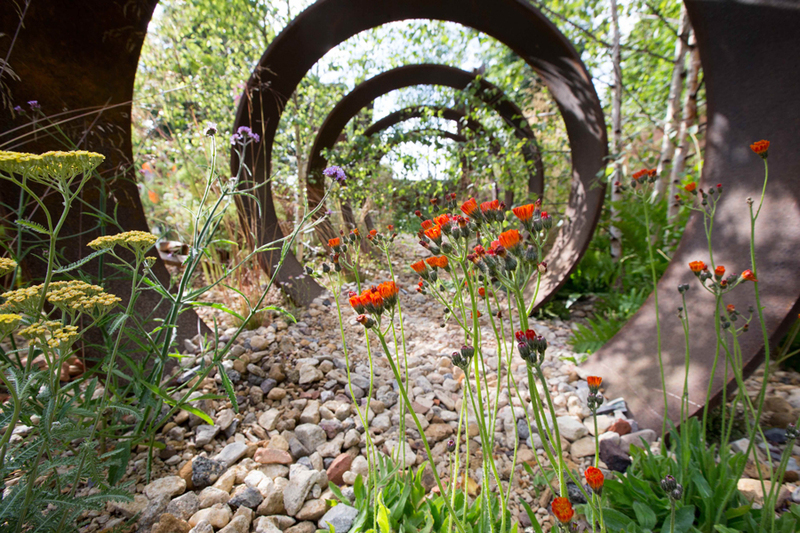 Created by Andreas Christodoulou and Jonathan Davies, the garden was judged to be best at highlighting how to relinquish control and allow for the natural process to take centre stage. A total of 50 Gold Medals have been awarded in the Floral Marquee as well as 36 Silver-Gilt, 23 Silver and four Bronze medals. Brighter Blooms, Dibleys Nurseries and W.S. Warmenhoven were among the Gold Medal winners. The prestigious Best Exhibit in the Floral Marquee went to orchid specialists Vacherot & Lacoufle (Gold). Marshalls Malmaisons (Gold) were awarded Best Plant Heritage Exhibit for their display of carnations and David Austin Roses Ltd., took the title for Best Rose Exhibit (Gold). Fernatix (Gold) were awarded the New Design Award and Hooksgreen Herbs won Best Cook & Grow Exhibit. Best Flower & Vegetable Box Award goes to Esher Molesey Garden Society who won the title for their Centenary Celebration flower box which celebrates the Society’s 100th anniversary. The RHS Master Grower award is a special feature within RHS Floral Marquees this year and a different nursery is featured at each show but the exhibits are not judged. Master Growers propagate the majority of their plant material using ethical and sustainable practices and are exemplary in all aspects of their business practice. The Master Grower at RHS Hampton Court 2017 is Penberth Plants. Best Exhibit in Floral Studio Design was awarded to Louise Roots for Leeds Castle. Congratulations to everyone, the standard this year is very high and with such a variety of gardens and exhibits, as well as a good deal of sun, RHS Hampton Court Palace Flower Show 2017 is definitely a winner. Picture credits: All pictures © individual designers and sponsors of relevant gardens.